Home / DeWit Cultivator-5 tine-11.5"
Works like a steel hand and is unphased by rock and hard soil. 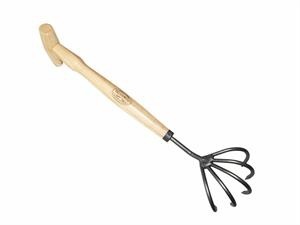 Great for general digging in the garden, but designed primarily as a cultivating tool to quickly rip up and aerate your garden soil. The extra head width of this model makes it the best choice for moving soil around in the planting beds. 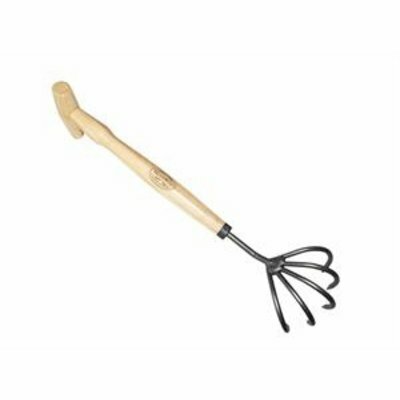 Makes quick work of hilling up dirt around fresh plantings. Tempered Swedish steel tines won't bend or break due to fatigue like stainless steel versions. The European Ash hardwood handle is durable and comfortable in the hand. But be forewarned. Once you've tried a DeWit gardening tool, no others will do! Purchase Outdoor Gardening DeWit Cultivator-5 tine-11.5"